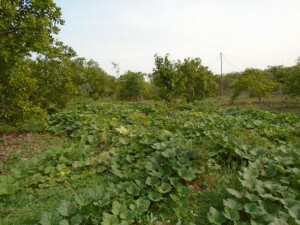 Vaiyubhoomi – or ‘land of air’ – is where we grow things less intensively than on the raised beds in the central area. The soil here is very poor. In the beginning, the site of the cashew orchard was covered with eucalyptus trees which were taken out with a huge mechanical digger. This was a drastic treatment, but we thought was the only way of completely removing the trees. These tenacious plants will grow even from very small pieces of root left in the soil and will completely take over any piece of land. Their roots give out a substance which makes it impossible for other trees to grow. This felt like a necessary radical surgery on the land, but we had very mixed feelings about the barren vista that it presented. When the rains came, later that year, in August we planted a green manure – a mixture of seeds that bring nitrogen to the soil.Then we planted the cashew trees which we had grown ourselves in our nursery, using cashews from a very good cashew tree growing in Auroannam farm. On the poor soil the plants have had quite a struggle to survive. This is despite the fact that we have composted and mulched them regularly. After five years we got our first nuts but for many years our harvests were not very good. This is partly because we allowed the trees to grow naturally and we neither sprayed or pruned them. Since we have never sprayed them one or more of them was attached by various pests, which meant in that year they did not produce. We have found that in the next year they often produced very well. What we have found is that as the trees grow larger the they produce more and seem more pest resistant. 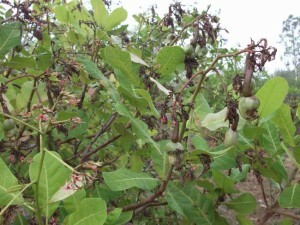 During the last three years after the area was fenced we inter-planted fruit trees amongst the cashews. The aim was to increase the diversity of bacteria in the soil as well as insects in the environment. Both of which help the cashews to resist pests and remain healthy.Growing healthy trees is obviously a long term project and, unlike the sprayed local trees, we expect that once they do start producing they will do so for many years. 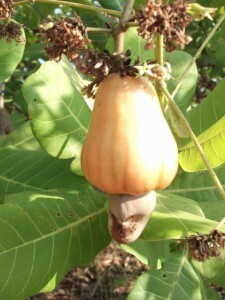 The cashew harvest takes place during April and May, usually the hottest times of the year. The nut forms first followed by the fruit from which it hangs. This is known as a ‘false fruit’ because it develops after the nut. Picking cashews is a filthy job because it means crawling around under the trees, along with the leaves and sundry insects, to pick up the fruit and nuts which have fallen down. Once picked the nuts and fruit are separated. The fruits are discarded, usually near the tree so they break down and provide nutrients for the soil and the nuts put in the sun to dry. The inner nut, which is to be eaten, then has to have to be removed from the shells. This is a specialist job as inside the shells the nuts are covered with a corrosive black substance that looks rather like glue. 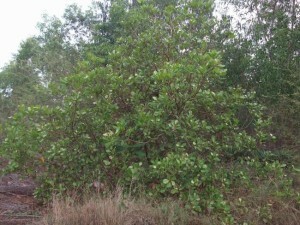 It can be extracted and used as a wood preservative. So far we have not been able to find a use for the fruit which has quite a lot of tannin in it and so is rather astringent in your mouth. Sometimes it can be combined with other fruit to make jam and in Goa it is used to make feni, an alcoholic drink. 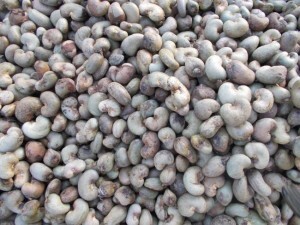 Cashews are a very useful cash crop. Before they became popular in the west and not an export item the price of cashews in India was less than peanuts. Now they are one of the most expensive nuts you can buy. 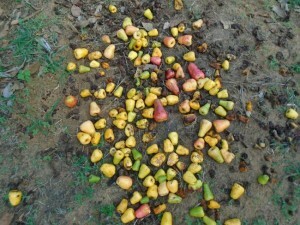 If you are here at the cashew harvest you will understand why! 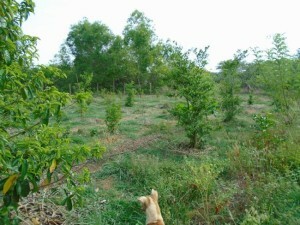 On one side of VaiyuBhoomi we have planted an orchard of food producing trees. Despite being irrigated some of them have struggled to survive in the poor soil conditions. A recent innovation in this area are what we call ‘intermittent vegetable beds’. These are made in the same way as our original vegetable beds and consist of earth banks. They are irrigated and here we grow long term vegetable crops that don’t need a lot of care. Like sweet potato and as shown in the picture, pumpkins.